This post is brought to you by Sunjack Portable Solar Charger. Living in one of the skiing capitals on the Northeast, you can imagine I get a lot of snow here. Do you know what happens when a ton (quite literally) of snow lays on branches dangling precariously over wires? Very bad things, that’s what. Power outages. Some lasting for days. Occasionally even a week or longer! Power outages in the summer and fall are a little easier. I can usually take my phone, tablet and laptop to a local internet café and recharge. During the winter, though, my car won’t even make it down my steep driveway, let alone out of my development. When the charge runs out, I’m done. My landline is no better, since we have cordless phones that don’t work without power. Stuck and totally cut off. It’s not only maddening, it’s dangerous. The Sunjack Portable Solar Charger is ideal for people like me who live off the main road in areas prone to power outages. Really, it’s perfect for anyone who wants to be able to charge their devices on the go, but I’m personally excited about how it can help me overcome my anxiety about winter and power outages. Ever since those 8 days with no power after Hurricane Sandy, I start to shake if the power so much as blinks for a moment. 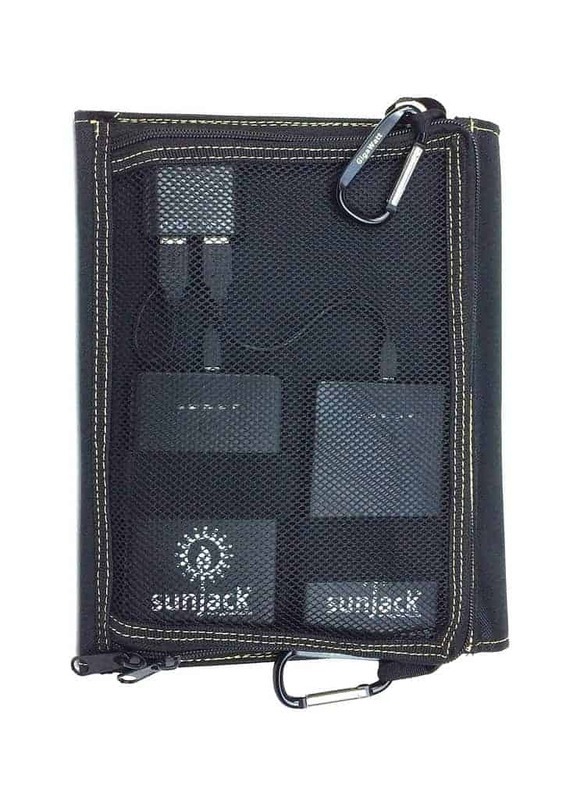 What is the Sunjack Portable Solar Charger? Really cool, that’s what it is. I’m not going to pretend to understand the science behind it. If you want all the techy specs, check out the Sunjack FAQs. If I try to explain them, I’m going to goof something up and make you think it can walk on the moon or something. I can tell you that it comes in 14 watts and 20 watts. The 14W SunJack comes with an 8,000mAh battery that has enough power to let you charge four iPhones after 5 hours in the sun. The 20W has two of those batteries, so you can charge 8 iPhones. The only part of that I really need to know: My mom and I can charge our phones after just 5 hours in the sun. What does this really mean to me? I can stay connected to the outside world. If there is an emergency, I can get help. Priceless. I can also charge it by plugging it into a wall, in case I need it to be ready immediately. If I know a storm is coming, I can get it all charged up that way. Then, when the power goes down for a few days, I can recharge it in the sun every morning. Sunjack Portable Solar Charger works with all USB devices, which is pretty much everything these days! I’m surprised my refrigerator doesn’t run on USB. Wouldn’t that be nice? It works with all Apple, Android, Windows, Blackberry, GoPro, Jawbone devices and so much more. Charge your camera, your tablet, your son’s gaming devices and wireless headphones. You can even find USB-powered lights! The Sunjack Portable Solar Charger was built strong enough for the military to use, which means it can stand up to even my klutziness! I could theoretically drop it on cement and run it over with my car without destroying it! You think I joke, but knowing me, this could very well happen. It’s good to know that the Sunjack can take my total inability to remember when things are sitting on top of my car! Think such an awesome device will cost you a fortune? Not at all. I was pleasantly surprised to see the very reasonable price tag on the Sunjack Portable Solar Charger. The Sunjack 14W is just $150. The 20W is $250. They also have some neat accessories, like a USB CampLight LED Bulb and a Weatherproof sleeve, all also very affordable. Head on over to the Sunjack Shop and grab yours before bad weather arrives! Now this is something that I could really use. Especially when we go camping. I dont bring my tablet camping but it would be nice for our cellphones! This is something to have on hand for sure! Any natural disaster can happen! My area is also prone to power outages due to weather so this would be great to have. Thanks for the review. For storm outages, it’s positively brilliant. I love, love this nifty gadget! I like that it folds down like that when you’re not using it. I imagine this really does come in handy! I need this for when I’m in the field. Sometimes we go out for weeks and if there are no generators we are without our phones. This would be awesome. This Sunjack charger is a great Christmas gift for me. I absolutely love this idea.. i always need a charge on something.. I need this! This is great for traveling. Thanks for sharing! This is such a cool idea! Definitely a great gift! This would be so great to have on hand anywhere I go! That is a brilliant idea!! I need to get one! this would be very handy while travelling as well when often you can not plug in!